I am not going to hold back - these almond lemon drizzle cakes are a total taste sensation. Bite into the cakes, and you get an explosion of sharp lemon mixed with the slightly gooey and sweet taste of the almonds. A lot of the cakes I bake contain ground almonds and not so much flour. These very moist, very lemony cakes are no exception. I am also using xylitol in place of ordinary sugar. Xylitol looks and tastes like sugar but has very little effect on raising your blood sugar. It is a vegetable sugar which is similar to fructose in fruit and has a very low GI. Note: if like me you want to get rid of those bingo-wings – whisk by hand when whisking is required. 1. Pre-heat the oven to 180C/350F/ gas mark 4. Either line a 12-hole cupcake tin with foil or paper cases or use a silicone miniature muffin tray. 2. Place the butter and sugar in a bowl. Use an electric whisk, or whisk by hand, to beat the butter and sugar together until pale and light. Use a large spoon and mix in first the ground almonds and the lemon zest, followed by one egg at a time. Sieve the flour into the bowl and mix it in quite quickly. 3. 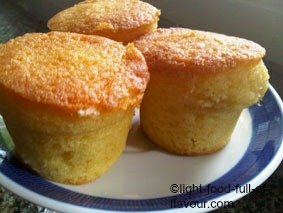 Divide the mixture between the cupcake cases and bake in the oven for 18-20 minutes, until nicely browned and springy. 4. While the cakes are baking, prepare the lemon drizzle by whisking together the lemon juice and the icing sugar. When the cakes are ready, prick them all over with a tooth-pick or a fork and then divide the lemon drizzle over the hot cakes. Leave to cool in the tin.